Used as natural treatment for liver problems. 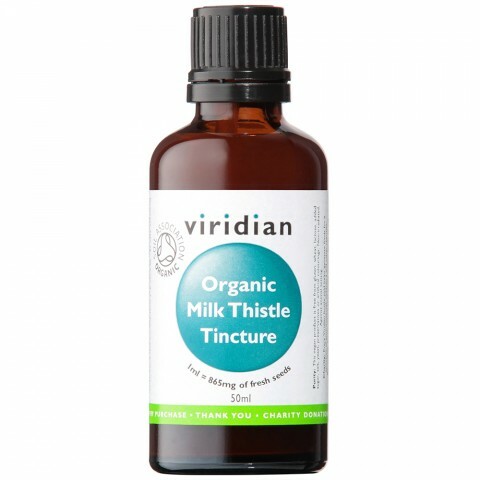 Viridian's 100% Organic Milk Thistle tincture is made with Silybum marianum seeds. Certified organic by the Soil Association - better for the planet, better for you. Milk thistle is a traditional remedy used for liver problems and part of a detox. Silybum marianum seeds, Organic alcohol. Directions: Take 15 - 30 drops, 2 -3 times daily in a little fruit juice or water.Ê Children under 12, half adult amount.Ê Please shake bottle before use to distribute the natural lipids in suspension.